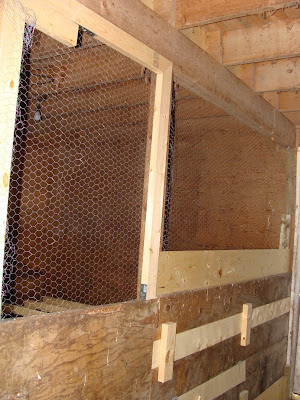 Most of the things I've read about chicken coops assume that you're either building one from scratch or have bought a ready-made one. The Eglu, for example, seems to be the in-thing for suburban chickens. 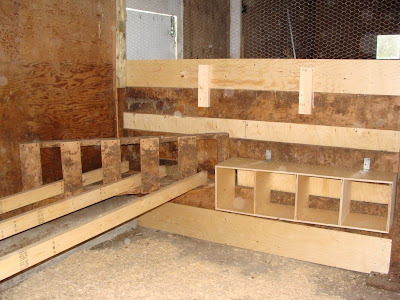 Our situation was a bit different, as we planned to convert one of the five stalls in our smaller barn into a home fit for chickens. 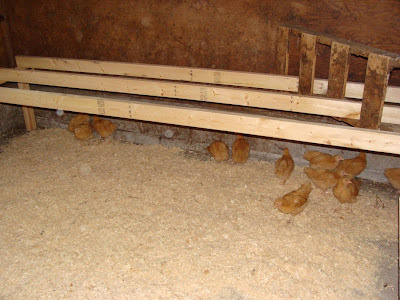 As the previous occupants of the barn were a lot bigger than chickens (limousin cattle), this involved a fair bit of work to ensure that the chickens wouldn't escape and that the coop would be safe from rats and any possible predators. The chickens were getting too big for their box, so we had to get this finished. Mike worked hard all day yesterday on this and I joined in when I got home from work. I'm really impressed with the end result. You can see how we've built around the original structure below. The dark wood is what was there before and the lighter coloured parts are the bits we've added. We still need to add a lip (and maybe a perch) to the front of the nest boxes, but as the chickens won't be laying for about four months, this isn't urgent! There's room to add another layer of nest boxes on top of the first ones, if our flock expands in the future. There's certainly room for more chickens in this space. We've put chicken wire above the edges of the stalls, so that there is still a fair bit of daylight coming in from the rest of the barn. The stall has a window in it too, which isn't shown in these pictures. The nest boxes were cunningly situated against a gap in the original stall fence, so that we could put in this really neat hatch behind them. This will mean we can collect eggs from the nest boxes without going into the coop itself. We introduced the chicks to their new home last night. They look ridiculously small in there now, but I'm sure they'll soon grow into it. Yeah Amanda- your are so official now! I love it and those nest boxes look great! I am still deciding if I want to paint mine or not. It would add some color and I probably should. Do the chicks absolutely love it or not? The chicks seem to be enjoying having all that space to run around in. They sleep on the floor still, all huddled together in a mass, so it will be interesting to see when they start perching at night instead. It's so great to have it all finished!